A Greenpeace report on May 18 accused oil major ExxonMobil of aiding research against the impacts of climate change. 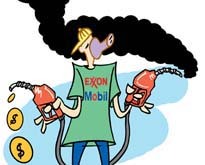 "ExxonMobil is still giving grants to research organisations that question the science of climate change," says the report. The company gave about us $23 million to such groups from 1998 to 2006 -- us $2.1 million to 41 organisations last year alone. But ExxonMobil said the institutions which accepted its grants were not necessarily representing the policies of the oil company. According to Greenpeace, tax documents of the oil major showed that it had given grants to 14 such groups. The company, however, classified funds as general support grants. According to Greenpeace, Exxon has been aiming to control the emerging climate policy debate in the us Congress and wants to soften the restrictions on greenhouse gas emissions that will affect the oil and gas industry. Greenpeace demanded the company cut such grants since the impacts of climate change has now been recognised and identified across the globe.